Superior fitness and skill combined with a relentless training regime perhaps….. but the two Tees teams also have to thank the dedication and skill of coach and cox Stuart Barlow for their impressive wins at the Northern League Skills event. 43 People, including 13 Durham ARC visitors, dashed up river to Yarm in a flurry of singles , doubles, quads and an eight on a perfect windless, slightly cloudy day. This month's minihead took place in beautiful weather conditions; still, calm water and the sun even shone! We had a bumper entry with 16 entries spread across all boat sizes and loads of singles! 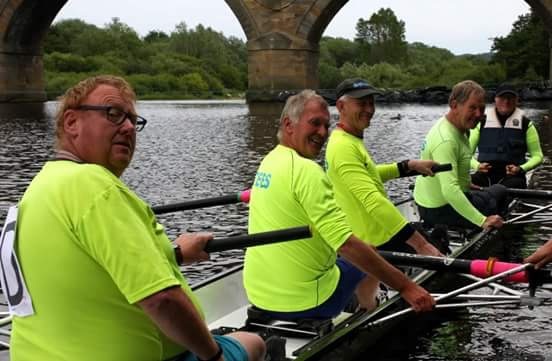 The sole representative from Tees at the third Northern League 2015 event enjoyed the fruits of their recent sweep training by winning two races at Hexham. Chastened by their previous poor performance the team had asked for coaching from Philip Searle, indulging also in video analyses of their performances. “After considerable training, we could only detect technique faults through dramatically slowing the action down” explained a grizzled team member with tongue firmly in cheek.